Athens was chosen as the host city during the 106th IOC Session held in Lausanne on 5 September 1997. Athens had lost its bid to organize the 1996 Summer Olympics to Atlanta nearly seven years before on 18 September 1990, during the 96th IOC Session in Tokyo. Under the direction of Gianna Angelopoulos-Daskalaki, Athens pursued another bid, this time for the right to host the Summer Olympics in 2004. The success of Athens in securing the 2004 Games was based largely on Athens' appeal to Olympic history and the emphasis that it placed on the pivotal role that Greece and Athens could play in promoting Olympism and the Olympic Movement. The bid for the 2004 Games was lauded for its humility and earnestness, its focused message, and its detailed bid concept. 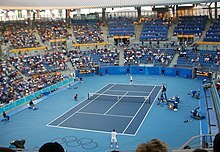 The 2004 bid addressed concerns and criticisms raised in its unsuccessful 1996 bid – primarily Athens' infrastructural readiness, its air pollution, its budget, and politicization of Games preparations. Athens' successful organization of the 1997 World Championships in Athletics the month before the host city election was also crucial in allaying lingering fears and concerns among the sporting community and some IOC members about its ability to host international sporting events. Another factor which also contributed to Athens' selection was a growing sentiment among some IOC members to restore the values of the Olympics to the Games, a component which they felt was lost. ^ a b c "Athens 2004". International Olympic Committee. olympic.org. Archived from the original on 17 January 2013. Retrieved 19 January 2008. ^ Winner Medals Archived 4 July 2011 at the Wayback Machine, Olympic Games Museum. Retrieved 27 July 2011. ^ a b c "Rogge: Athens 'unforgettable, dream Games'". ESPN. Associated Press. 29 August 2004. Retrieved 28 July 2012. ^ Weisman, Steven R. (19 September 1990). "Atlanta Selected Over Athens for 1996 Olympics". The New York Times. Retrieved 23 September 2008. ^ Rowbottom, Mike (6 September 1997). "Athens wins 2004 Olympics". The Independent. London. Retrieved 25 May 2010. ^ Longman, Jere (6 September 1997). "Athens Wins a Vote for Tradition, and the 2004 Olympics". The New York Times. Retrieved 25 May 2010. ^ Longman, Jere (3 August 1997). "Athens Pins Olympic Bid to World Meet". The New York Times. Retrieved 23 September 2008. ^ a b Anderson, Dave (7 September 1997). "Athens Can Thank Atlanta for 2004 Games". New York Times. Retrieved 25 May 2010. ^ "International Olympic Committee – Athens 2004 – Election". Olympic.org. Retrieved 15 March 2010. ^ "Cost of Athens 2004 Olympics". Embassy of Greek. greekembassy.org. Archived from the original on 19 December 2007. Retrieved 13 November 2004. ^ a b c "Unity Olympics Album". The Star Online eCentral. 2004. Archived from the original on 22 April 2008. Retrieved 16 August 2008. ^ "Workers in peril at Athens sites". BBC News. 23 July 2004. Retrieved 16 August 2008. ^ Pfanner, Eric (30 August 2004). "Athens Games beating Sydney in TV race". International Herald Tribune. Archived from the original on 12 September 2007. Retrieved 18 August 2006. ^ "You're Athletes, Not Journalists". Wired News. 20 August 2004. Archived from the original on 24 June 2007. Retrieved 18 August 2006. 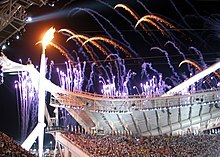 ^ "Master of Olympic Pageantry Prepares One Final Blowout". New York Times. Associated Press. 29 August 2004. Retrieved 25 May 2010. ^ "SOUNZ – NZ composer – John Psathas". Archived from the original on 11 August 2009. Retrieved 7 August 2009. ^ a b c d e f g h i j "Athens 2004". IOC. Archived from the original on 17 January 2013. Retrieved 28 July 2012. ^ "The Company". Aia.gr. 28 March 2001. Archived from the original on 18 February 2010. Retrieved 15 March 2010. ^ "AttikoMetro Inside". Ametro.gr. 9 September 2009. Archived from the original on 11 February 2010. Retrieved 15 March 2010. ^ "Tram Sa". Tramsa.gr. 22 February 2010. Archived from the original on 23 March 2010. Retrieved 15 March 2010. ^ "Unification of Archaeological Sites in the Centre of Athens". Minenv.gr. 4 November 1995. Archived from the original on 16 July 2011. Retrieved 15 March 2010. ^ "As Olympic Glow Fades, Athens Questions $15 Billion Cost". Csmonitor.com. 21 July 2008. Retrieved 15 March 2010. ^ "Hellenic Olympic Properties: The Company". Olympicproperties.gr. Archived from the original on 12 December 2008. Retrieved 15 March 2010. ^ "After The Party: What happens when the Olympics leave town". The Independent. London. 19 August 2008. Retrieved 15 March 2010. ^ (AFP) – 30 July 2008 (30 July 2008). "Four years after Athens Greeks have Olympics blues". Google. Archived from the original on 6 August 2008. Retrieved 15 March 2010. ^ Malone, Andrew (18 July 2008). "Abandoned, derelict, covered in graffiti and rubbish: what is left of Athens' £9billion Olympic 'glory'". Daily Mail. UK. Retrieved 25 August 2008. ^ "AEK F.C. Official Web Site". Aekfctickets.gr. Archived from the original on 12 February 2010. Retrieved 15 March 2010. ^ McNulty, Phil (23 May 2007). "BBC SPORT | Football | Europe | AC Milan 2–1 Liverpool". BBC News. Archived from the original on 2 March 2010. Retrieved 15 March 2010. ^ "Athens Grand Prix 2009". Tsiklitiria.org. 13 July 2009. Archived from the original on 30 July 2008. Retrieved 15 March 2010. ^ "ATHENS, GREECE CONCERT, SAT. September 20, 2008 | The Official Jennifer Lopez Site". Jenniferlopez.com. Archived from the original on 14 May 2010. Retrieved 15 March 2010. ^ "Ολυμπιακό Αθλητικό Κέντρο Αθηνών". Oaka.com.gr. Archived from the original on 27 April 2010. Retrieved 15 March 2010. ^ "Panathinaikos Bc::::Εδρα::::". Paobc.gr. Archived from the original on 10 March 2010. Retrieved 15 March 2010. ^ "AEK B.C. | Official Web Site". Aekbc.gr. Retrieved 8 September 2015. ^ "www.athens2008.fiba.com – Home page". Archived from the original on 27 May 2008. Retrieved 24 May 2008. ^ "Pop icon set for show in Athens this September". ekathimerini.com. 11 June 2008. Retrieved 15 March 2010. ^ "Eurovision Song Contest 2006 Final | Year page | Eurovision Song Contest – Oslo 2010". Eurovision.tv. 20 May 2006. Archived from the original on 2 December 2008. Retrieved 15 March 2010. ^ "Ολυμπιακό Αθλητικό Κέντρο Αθηνών". Oaka.com.gr. Archived from the original on 1 May 2009. Retrieved 15 March 2010. ^ "Ολυμπιακό Αθλητικό Κέντρο Αθηνών". Oaka.com.gr. 22 March 2008. Archived from the original on 1 May 2009. Retrieved 15 March 2010. ^ "Ολυμπιακό Αθλητικό Κέντρο Αθηνών". Oaka.com.gr. 16 July 2006. Archived from the original on 1 May 2009. Retrieved 15 March 2010. ^ "Athens Tennis Academy". Athenstennisacademy.gr. Archived from the original on 10 February 2009. Retrieved 15 March 2010. ^ "Αρχειο Εκδηλωσεων". Sef-stadium.gr. Archived from the original on 8 April 2008. Retrieved 15 March 2010. ^ "Πανιωνιοσ – Κ.Α.Ε". Panioniosbc.gr. 20 October 2009. Archived from the original on 10 February 2010. Retrieved 15 March 2010. ^ "High hopes for park at Hellenikon". ekathimerini.com. 3 August 2007. Retrieved 15 March 2010. ^ a b "Ολυμπιακά Ακίνητα: Μεταολυμπιακή Αξιοποίηση". Olympicproperties.gr. Archived from the original on 1 August 2013. Retrieved 15 March 2010. ^ "Εθνικός". Sport.gr. Archived from the original on 9 June 2009. Retrieved 15 March 2010. ^ a b c "Ολυμπιακά Ακίνητα: Η πορεία της μεταολυμπιακής αξιοποίησης των Ολυμπιακών Ακινήτων". Olympicproperties.gr. Archived from the original on 8 May 2009. Retrieved 15 March 2010. ^ "Renzo Piano Chosen to Design New Greek Opera, Library Complex". Bloomberg. 21 February 2008. Retrieved 15 March 2010. ^ "Ολυμπιακά Ακίνητα: Μεταολυμπιακή Αξιοποίηση". Olympicproperties.gr. Archived from the original on 1 August 2013. Retrieved 15 March 2010. ^ "Ολυμπιακά Ακίνητα: GFestival 2005". Olympicproperties.gr. 15 June 2005. Archived from the original on 1 August 2013. Retrieved 15 March 2010. ^ "Isaac Hayes Στο Κλειστο Φαληρου". i-stores.gr. Archived from the original on 24 January 2006. Retrieved 15 March 2010. ^ "Κλειστό Γυμναστήριο Φαλήρου – Morrissey | Siteseein.gr Blog". Siteseein.gr. 27 November 2006. Archived from the original on 16 July 2010. Retrieved 15 March 2010. ^ Metaforce – Fuel. "Badminton Theater". Badmintontheater.gr. Archived from the original on 26 January 2010. Retrieved 15 March 2010. ^ "Ολυμπιακά Ακίνητα: Ολυμπιακό Κέντρο Γουδή". Olympicproperties.gr. Archived from the original on 15 September 2008. Retrieved 15 March 2010. ^ "Horse Racing | Hellas Vegas". Hellasvegas.gr. Archived from the original on 30 May 2009. Retrieved 15 March 2010. ^ "FEI European Jumping Championship for Children – Markopoulo (GRE), 10–13 July 2008". Hunter Jumper News. 30 June 2008. Archived from the original on 20 July 2011. Retrieved 15 March 2010. ^ "Ολυμπιακά Ακίνητα: Ελληνική Ομοσπονδία Ιππασίας – Αγωνιστικό Πρόγραμμα 2008". Olympicproperties.gr. 24 May 2008. Archived from the original on 1 August 2013. Retrieved 15 March 2010. ^ "The Subaru Enthuisast Website". Subdriven. 25 May 2007. Archived from the original on 17 January 2010. Retrieved 15 March 2010. ^ "Ανακοινώσεις, Εκδηλώσεις, Νέα". Unipi.gr. Archived from the original on 7 September 2009. Retrieved 15 March 2010. ^ "Ορεινη Ποδηλασια". Parnitha-np.gr. Retrieved 15 March 2010. ^ "Parnitha Olympic Mountain Bike Venue – Attraction in Athens, Greece – Ratings and Information". TravelMuse. Retrieved 15 March 2010. ^ "eurorowing-2008.com". eurorowing-2008.com. Retrieved 15 March 2010. ^ WebSide Associates SA. "Official Website". World Rowing. Archived from the original on 17 March 2009. Retrieved 15 March 2010. ^ "IRAKLIS FC Official Web site". Iraklis-fc.gr. Archived from the original on 23 June 2009. Retrieved 15 March 2010. ^ "Καυτανζόγλειο Στάδιο – Θεσσαλονίκη". Kaftanzoglio.gr. 27 August 2004. Archived from the original on 6 March 2010. Retrieved 15 March 2010. ^ George Xenides. "Georgios Karaiskakis Stadium". Stadia.gr. Retrieved 1 February 2012. ^ "EISITIRIA DIARKEIAS 2008-09.indd" (PDF). Archived from the original (PDF) on 24 August 2009. Retrieved 15 March 2010. ^ a b George Xenides (20 February 2005). "Παγκρήτιο Στάδιο". Stadia.gr. Archived from the original on 4 April 2010. Retrieved 15 March 2010. ^ "Παε Διεθνησ Ενωσισ Εργοτελησ". Ergotelis.gr. Retrieved 15 March 2010. ^ "Hellenic Ministry of Culture and Tourism | Panathenaic Stadium". Odysseus.culture.gr. Archived from the original on 17 April 2010. Retrieved 15 March 2010. ^ "news in.gr – Δωρεάν συναυλία στο Καλλιμάρμαρο δίνουν οι R.E.M". In.gr. Retrieved 15 March 2010. ^ "Hellenic Ministry of Culture and Tourism | Olympia". Odysseus.culture.gr. Archived from the original on 9 March 2010. Retrieved 15 March 2010. ^ "Lamda Development". Lamda Development. Archived from the original on 25 December 2008. Retrieved 15 March 2010. ^ "Ελλάδα – Ευρώπη – Κόσμος : Η ζωή έχει χρώμα". fe-mail.gr. Archived from the original on 10 February 2010. Retrieved 15 March 2010. ^ "Olympic Cities: Booms and Busts". Cnbc.com. 19 January 2012. Retrieved 7 February 2014. ^ "2010-2018 Greek Debt Crisis and Greece's Past: Myths, Popular Notions and Implications". Academia.edu. Retrieved 14 October 2018. ^ "Did 2004 Olympics Spark Greek Financial Crisis?". CNBC. 3 June 2010. Retrieved 17 December 2018. ^ a b Nevradakis, Michael (7 August 2012). "The True Olympic Legacy of Athens: Refuting the Mythology". The Huffington Post. Retrieved 19 February 2017.